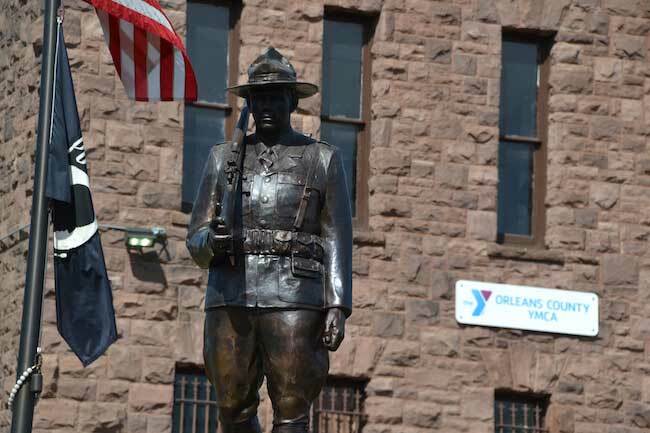 MEDINA – The bronze statue of a soldier, resembling a doughboy from pre-World War II, was mounted atop a monument today in front of the Orleans County YMCA. Cody Dix of the Medina DPW is at right. That building has been a Y for more than three decades. But for 76 years it was the Medina Armory, a site used to train soldiers for battle. The new statue looks to be right at home by the former Armory. The statue is taken out of the YMCA, where it spent the winter inside. The statue was finished in November and made its public debut in the Parade of Lights on Nov. 24. The Armory opened in 1901. In 1977, it was closed by the National Guard. Bill Menz trained at the building in 1953, when he joined Company C of the 174th Armored Infantry. He was promoted to corporal before transferring to active duty in 1956 to the US Army National Guard. He would come back to Medina and work about 40 years in construction as a plasterer/mason. The Menz family is pictured with the statue and monument after the installation today. Pictured include Menz’s wife Betty, second from left, and their four children, from left: Timothy Menz, Mary Beth Germano, granddaughter Alyssa Germano, Lynne Menz (in back) and Tam Menz. When the Armory closed, Bill Menz was on the committee that helped it find a new use as a YMCA. Menz, who died at age 86 on July 16 last year, wanted the community to know the building’s historical role in preparing soldiers to fight on behalf of the country. 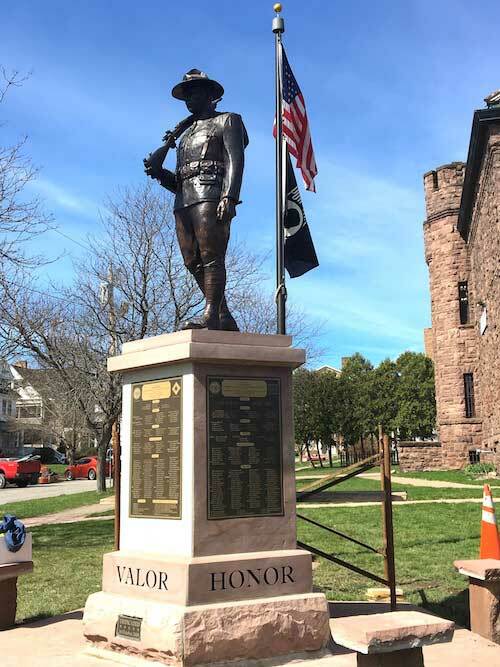 He teamed with his friend John Fuller to create a sandstone monument in front of the Y that listed 550 soldiers who trained at the Armory and were then deployed in wars. Menz and Fuller cut the stone and built the monument. But it wasn’t done. Menz wanted a bronze statue of a soldier on top. He pushed for nearly a decade to raise the $65,000 for the statue. He was able to see it in pieces at the foundry before his death. His daughter, Lynne Menz, included some of her father’s ashes underneath the statue’s base, just before it was mounted today. Mary Beth Germano, center, is one of Menz’s four children. She takes a photo of the statue being moved out of the former Armory, down Pearl Street and to the front lawn of the building. Germano thanked the local residents and many veterans’ organizations for supporting the project with donations. Her father was unwavering in pushing the project in the community. “When he had his mind set on something, it was full-speed ahead,” Germano said. Ben Lacy, right, of the Medina DPW was off from work today but wanted to help with the statue installation. Lacy grew up next door to Menz. Lacy said he admired Menz’s determination in working on the monument and memorial for the local soldiers. “Bill was dedicated to get this done and I wanted to help today to get this up and done,” Lacy said. The statue was created by sculptor Brian Porter and the University of Buffalo’s foundry director Chris Serano. Mayor Michael Sidari was among the onlookers watching the statue installation today. He said the statue is great addition to Medina. 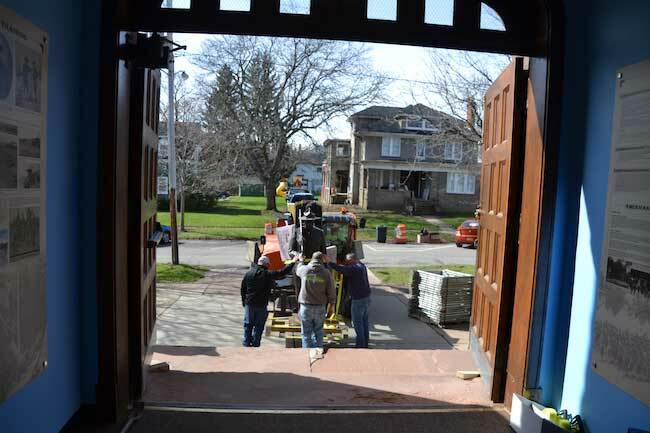 Medina next month will also welcome the return of a World War I cannon. It had been a fixture at State Street Park for about 80 years. It has been gone since March 2018 while the cannon has been refurbished in Altoona, Pa. at Seed Artillery Reproduction and Restoration. 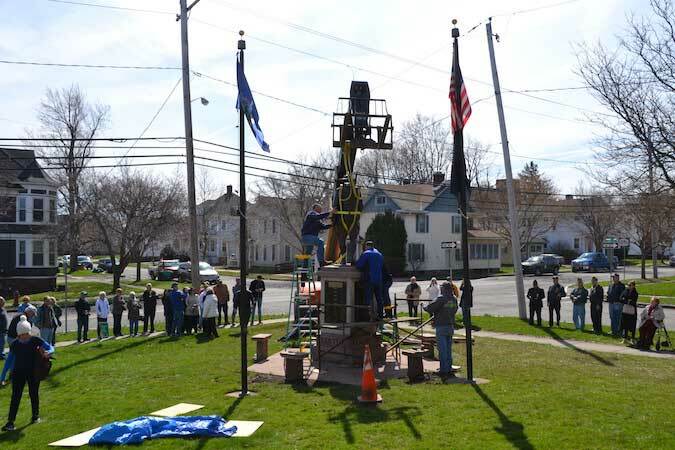 It is coming back to Medina on May 1 and will be rededicated on Memorial Day. The statue is expected to be formally dedicated during a ceremony in September. That will give time for landscaping work and some changes to be made to the plaques on the monument. Some lights may also be added to the site. For more on the statue and monument, click here. 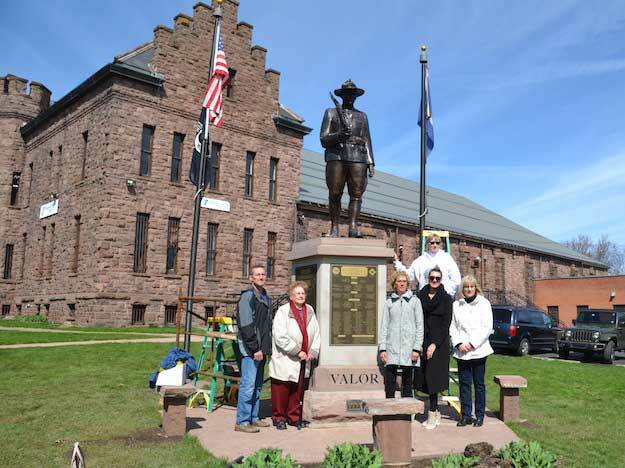 MEDINA – A 7-foot-high bronze statue of a soldier was installed this morning on a Medina sandstone base that is a memorial to the soldiers who trained at the former Medina Armory. The memorial has been more than a decade in the making. 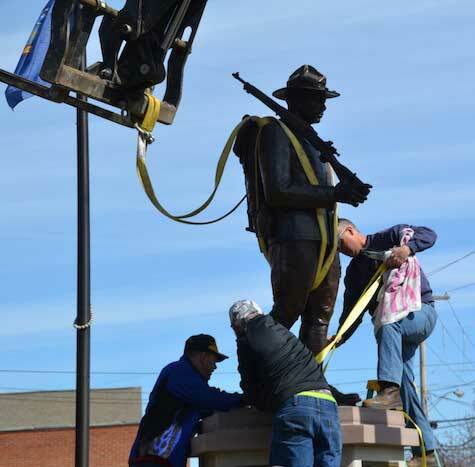 The statue was complete in November and made its first public appearance during Medina’s Parade of Lights on Nov. 24. 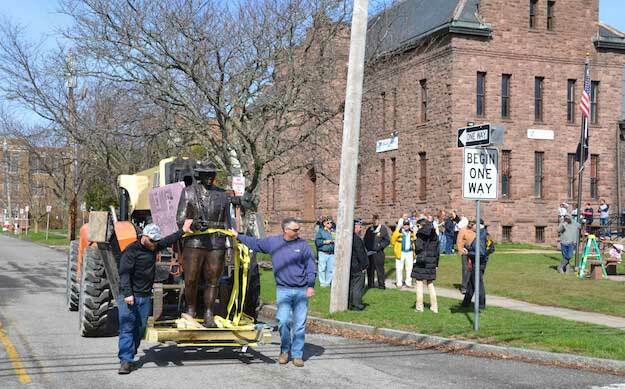 The statue was placed inside the former Armory on Dec. 20. The building is now used as a YMCA. 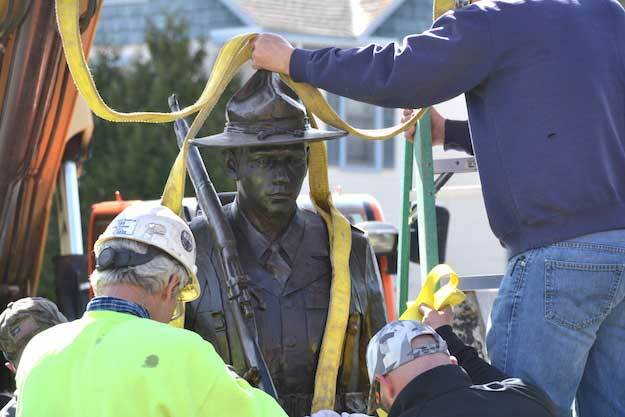 Medina DPW workers helped move the statue today. They include Joe Perry, the DPW superintendent (back to camera), and employees Ben Lacy (right) and Cody Dix (left). The statue was moved out of the YMCA, where it spent the winter. The Medina Armory opened in 1901 for Company F, which formed in 1891. In 1977, the National Guard left the Medina Armory. The site has been used as a YMCA for more than three decades. 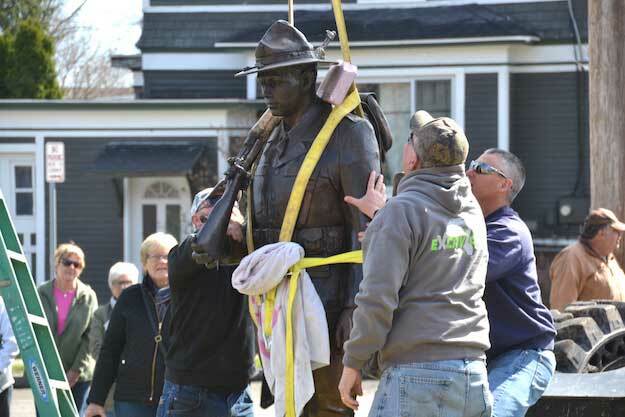 The statue, which weighs 1,400 pounds, is moved down Pearl Street to go on the monument in front of the Y. A crowd of people, including many local veterans, gathered to watch the installation. The late Medina resident Bill Menz was influential in building the sandstone monument and raising more than $65,000 for the statue. A dedication is expected in September for the statue. That will give time for landscaping and additional work on the plaques on the monument. The monument currently includes 550 names of local soldiers who fought in wars on behalf of the United States. The soldiers enlisted and trained at the Medina Armory for conflicts from 1898 to 1945 including the Spanish-American War, Mexican-American, World War I and World War II. The statue stands prominently outside the Orleans County YMCA. Orleans Hub will have another article later today on the statue installation. MEDINA – The Medina Board of Education has approved a $40,274,056 budget for the 2019-20 school year which won’t increase taxes for the 8th straight year. The budget will go before residents on May 21, with the vote from noon to 8 p.m. The district will go over the budget during a public hearing at the annual meeting, 6:30 p.m. on May 14 at the district office. The overall spending is up about $2.7 million from the $37,565,842, with a capital project driving some of the increase. The district’s overall instruction costs are up about $1 million with more money for teacher salaries, special education programs, and computer-based instruction programs based on the 1:1 rollout of Chromebooks for about 900 students. The district currently provides the Chromebook computers to about 500 students in grades 4 to 7. That will expand to grades 3 through 8, and 11th grade next school year. The following school year, 2020-2021, Medina wants to have the computers available to students in grades 3 through 12, about 1,150 total. The computers, with a warranty and software, cost about $330 to $340 each. The district’s BOCES aid through the state is covering about 80 percent of those costs, said Mark Kruzynski, district superintendent. The district will maintain all current programs and staff in the proposed budget, and is restoring foreign language at Wise Middle School, adding a 2/3 full-time music choral teacher at Wise, and combining the .5 ELA with a .5 reading teacher at the high school. The tax levy will remain the same at $8,641,861. This is the eighth consecutive year Medina has either reduced taxes or held them in check, and the 11th out of the past 12 years. MEDINA – Meadow Snyder, 6, of Wilson leads a pack of kids up the hill at The Gallagher on North Gravel Road during an Easter egg hunt this afternoon. 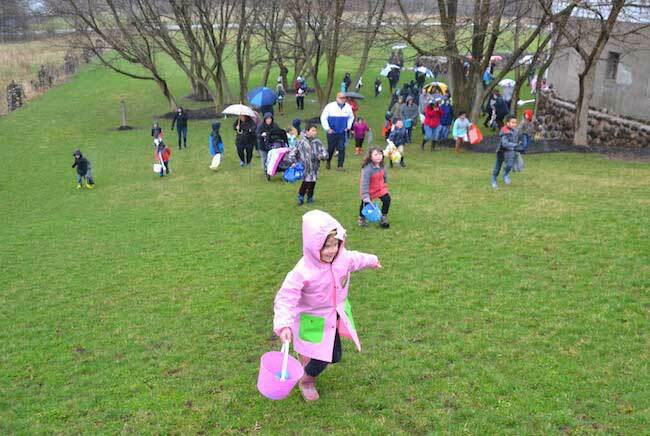 More than 100 children came out for the egg hunt, despite the rain. 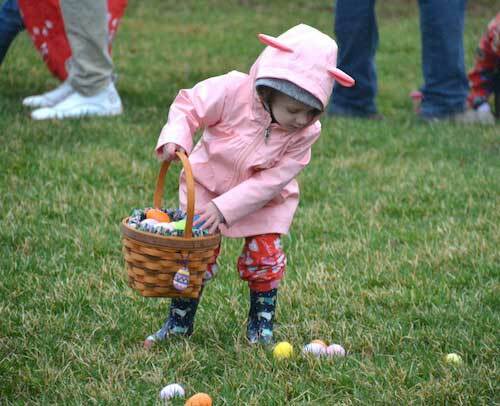 Jenna Uderitz, 2, of Albion fills her basket with Easter eggs. 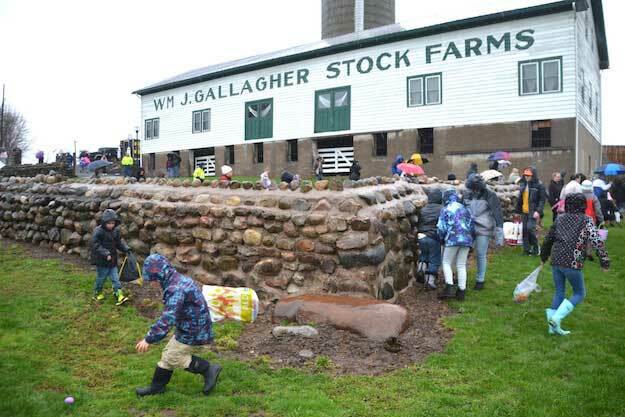 Jenna and Martin Bruning, owner of The Gallagher, have hosted an egg hunt the previous two years for friends and family. This year they opened it up to the community. They had 540 kids signed up for the event, although the turnout was less due to the rain. The Brunings were pleased to see so many come out for the event despite a steady downpour. The Gallagher is now an events center, and hosts many weddings each year. The Brunings have a new pavilion in back, and are expanding the use of the property for dances and other special events. 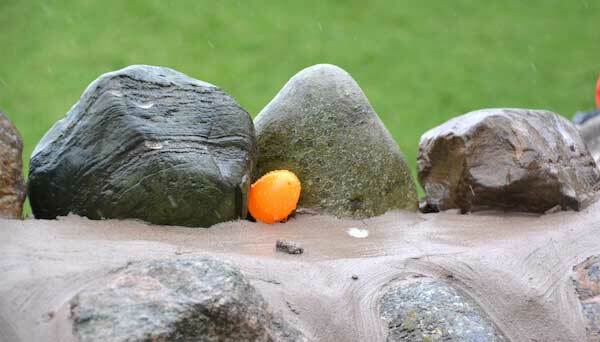 The Brunings hid 3,000 eggs on the property, including this one on the stone wall in front of the barn. 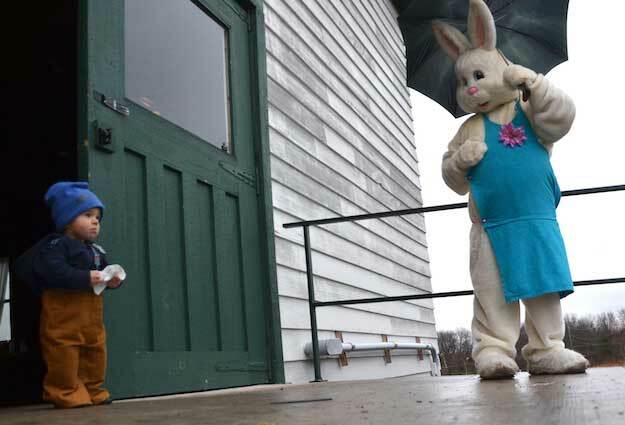 Samuel Conde, 1, of Albion is a little apprehensive around the Easter Bunny. 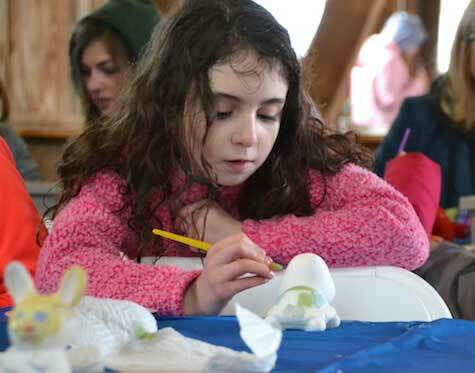 Sophie Kozody, 7, of Medina paints a turtle from Brushstrokes Studio. After the egg hunt, some other activities moved inside the barn. Photos by Tom Rivers: The top of St. Louis Catholic Church in Buffalo is an open work lattice spire that reaches 245 feet high. 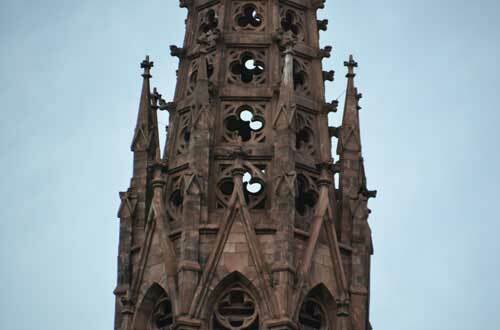 It is the tallest open-work spire ever built completely of stone in the United States, and it is also believed to be the only remaining open-work or pierced spire in the U.S.
MEDINA – The 2019 Medina Sandstone Society’s bus tour is headed to Buffalo to see some of the city’s landmark structures that are made of local sandstone. The Sandstone Tourism Committee – consisting of chair Sue Holland, Gabrielle Barone, Peggy Schreck and Rob Klino – have put together an exciting day, which will include several structures previously inducted into the Sandstone Hall of Fame and lunch at the historic Hotel Henry’s 100 Acres Restaurant. 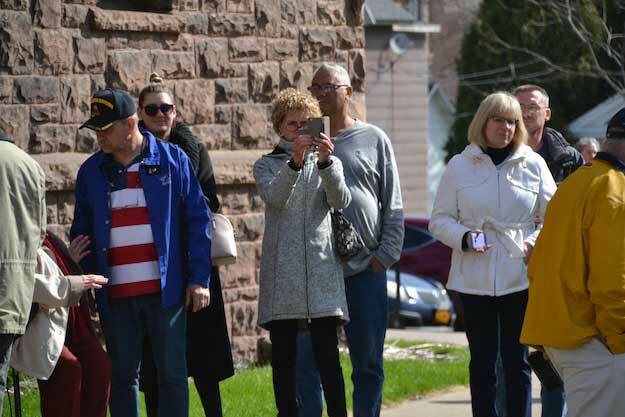 The first tour sponsored by the Medina Sandstone Society took place in 2008 and was an idea of the late Bob Waters, who came up with the idea of a walking tour of Medina’s Main Street. Forty-five people took part in the tour, led by then County Historian Bill Lattin. The next year, Lattin led another tour of Medina’s downtown, ending at the Medina Historical Society, in which 61 participated. The year 2010 saw 68 people take part in the tour of three Medina churches – St. Mary’s, First Baptist and St. John’s, each made of different colors of Medina sandstone. In 2011, Lattin included Todd Bensley of the Medina Historical Society in a canal walk to Medina Falls, in which 60 people participated. The following year, 71 people signed up for a tour of Boxwood Cemetery, led by Lattin and Bensley. After a tour of Main Street which focused on the newly installed historical panels, the Sandstone Society took a four-year break. St. Paul’s Cathedral was built by the Episcopal Church from 1849-1851. The church used stone from a quarry in Hulberton. 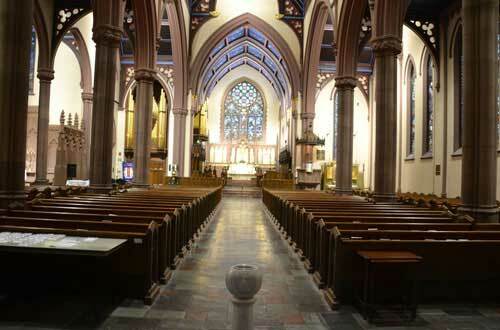 This church was Buffalo’s first major architectural landmark. It was designed by Richard Upjohn after he earned a national reputation for his design of the Trinity Episcopal Church in New York City. Last year, Holland came up with the idea of an Orleans County Hall of Fame bus tour, which Lattin agreed to narrate. It included sites in Orleans County that are in the Medina sandstone Hall of Fame. In Medina the stops included Holy Trinity Parish (St. Mary’s Catholic Church), the former Armory (now the Orleans County YMCA) and then St. John’s Episcopal Church. The tour went to Albion and included the Pullman Memorial Universalist Church, First Presbyterian Church and Mount Albion Cemetery. The group then went to Holley to see St. Mary’s Catholic Church and Hillside Cemetery, where the chapel has the only flying buttress in the county. “That was so successful, we decided to branch out,” Holland said. For the first time, this year’s tour will take participants on a bus tour to Buffalo , to view and tour interiors of historic Medina sandstone structures. After gathering at 8:30 a.m. at Medina City Hall and viewing the Sandstone Hall of Fame on the second floor, the bus will depart for Buffalo . One of the most anticipated stops will be the Hotel Henry, an elegant hotel in the Richardson Olmsted Complex. Construction on the 147-year-old Richardson Olmsted Campus began in 1872 and opened in 1880 as the state-of-the-art Buffalo State Asylum for the Insane. It closed a century later, to reopen after a $100 million renovation as the new Hotel Henry. The hotel is named after its designer, Henry Hobson Richardson, who worked alongside landscape architect Frederick Law Olmsted, who also laid out nearby Delaware Park . After the Richardson Complex fell into disrepair, a group of local preservationists in the early 2000s sued the state, forcing them to fix it up. The extensive renovation took 15 years and millions of taxpayer dollars. The Hotel Henry has become one of Buffalo’s premier destinations for weddings and special occasions. The second floor houses the 100 Acres Restaurant, which was named for the 100 acres set aside for patient farmland when the hospital first opened. Eighty-eight guestrooms and suites are located in the two buildings flanking the towers. 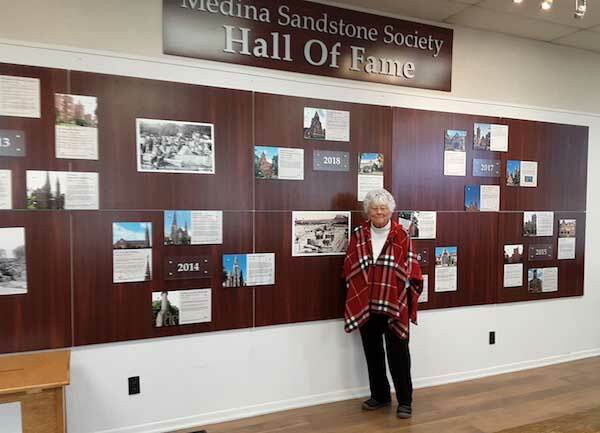 Photo by Ginny Kropf: Sue Holland, a director with the Medina Sandstone Society and chair of the Tourism Committee, stands before the Sandstone Wall of Fame in Medina ’s City Hall. On May 8, the Medina Sandstone Society will sponsor a day-long bus tour to several sandstone structures in Buffalo, including lunch at the historic Hotel Henry at the Richardson Olmsted Complex, which is in the Medina Sandstone Society’s Hall of Fame. The bus will drive by Lafayette Lofts, a luxurious residential complex created by the Lafayette Avenue Presbyterian Church; Buffalo Connecticut Street Armory; First Presbyterian Church, across from Kleinhans Music Hall; and Ashbury Hall/Babeville. All have been inducted into the Medina Sandstone Hall of Fame. Participants will disembark and tour St. Louis Church and St. Paul’s Cathedral, both of which are also in the Sandstone Hall of Fame. On the bus ride to Buffalo, two videos by Channel 2 will be shown – the first when Bob Waters and Todd Bensley were interviewed and the second where Lattin discussed the origin of sandstone quarries. “The chance to see these videos is a real plus,” Holland said. Holland also said the Sandstone Society is having booklets made of all the sites, and these will be given to riders. “They will definitely get their money’s worth,” she said. Anyone wishing more information may contact Holland at shollan2@rochester.rr.com, by calling (585) 721-3809 or by clicking here for the Sandstone Society website. Photos by Ginny Kropf: Rich Lovelace is Peter in the Easter cantata “Come Walk With Me,” being presented Saturday and Sunday by MACT and PACT. Diane Thurber, theatrical director for the Easter cantata “Come Walk With Me” works with the cast during a rehearsal at the Medina United Methodist Church. 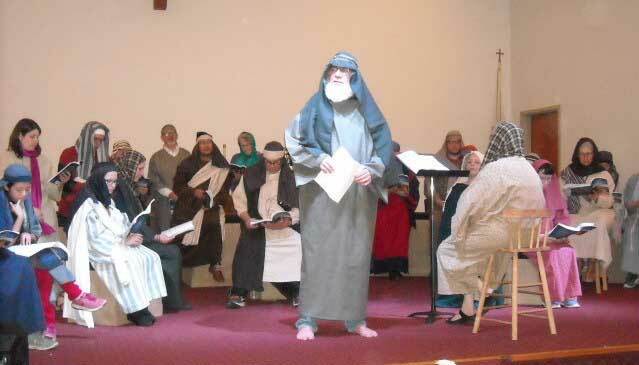 MEDINA – The Medina Area Christian Theater ’s annual Easter cantata has a lot of “firsts” this year. Joining them for the first time will be members of Pastors Aligned for Community Transformation, a group of five pastors started 20 years ago by Pastor Dan Thurber to pray for members of the community. Also, for the first time, the cantata will be presented at a school, instead of a church. And, having a performance in Albion is also a first. “Come Walk With Me” features a cast of 56 and will be presented at 7 p.m. Saturday at the Albion Middle School Auditorium and at 3 p.m. Sunday at Medina High School Auditorium. Cast members this year represent 13 churches in Orleans County and the Hartland Baptist Church in Gasport. The cast this year is one of the largest in the history of the cantata, directors said. Lead cast members are Randall Bane as the grandfather, Rick Boyle as Luke, Cody Taylor as Jesus, Rich Lovelace as Peter, Mike Wright as Pontius Pilate, and Bill Parker as John. 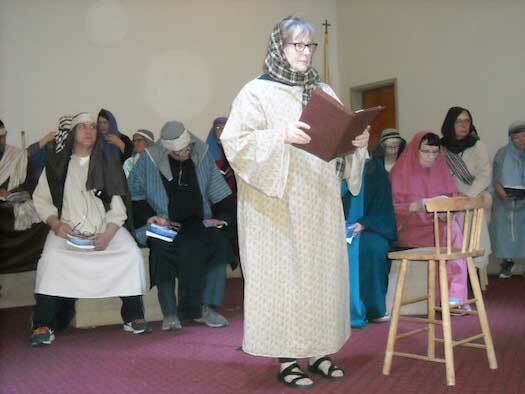 The cast of 56 is the largest ever in the Easter cantata being presented this year on Saturday and Sunday by the Medina Area Christian Theater. Joining them for the first time are members of Pastors Aligned for Community Transformation. They are rehearsing here at the Medina Methodist Church at the Grove. Elaine Lovelace is musical director and Diane Thurber is theatrical director. The collaboration between MACT and PACT came as a result of PACT contacting MACT and asking if they could be involved. MACT was created out of the original social musical theater started more than two decades ago by Jan Cramer and the Rev. Dan McDowell of Medina First Baptist Church. After McDowell left, Elaine Lovelace took over directing. 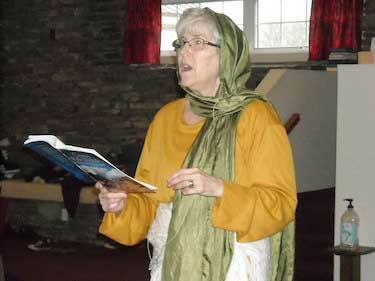 Elaine Lovelace is musical director of the annual Medina Area Christian Theater’s Easter cantata. The cantata really grew in prominence 12 years ago when the Rev. Larry Eastlack came to town and wanted to put on a big Christmas musical, Lovelace said. 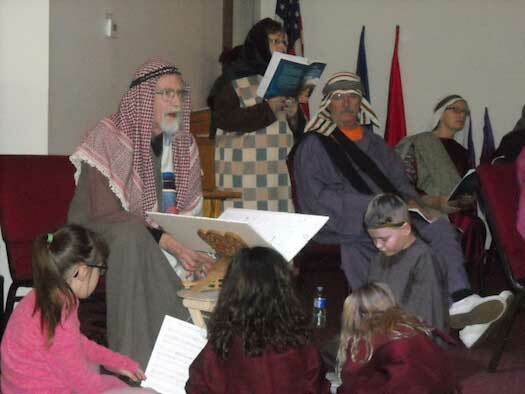 The new group became the Medina Area Christian Theater and Lovelace has directed it ever since. MACT traditionally puts on two presentations a year – at Christmas and Easter. A committee consisting of Elaine Lovelace, Robin Watts and Nicole Bacon usually meet to choose the production. Watts also makes all the costumes for the group. The cantata is free and directors hope the new venues will result in larger crowds. Randall Bane is the grandfather in the Easter cantata. Here, he reads to children about his travels with Jesus. Photo by Tom Rivers: The Medina Mustang Band performs Sept. 22 during its home show at the Fall Festival of Bands. LYNDONVILLE – Medina and Lyndonville have set June 17 for an open house on the shared sports programs, given students and parents from both school districts a chance to meet coaches, athletic directors and other school leaders from both districts. Lyndonville will host the open house in the evening on June 17. The time hasn’t been set yet. The two districts starting sharing some programs six years ago, first with boys varsity soccer. That has expanded to eight shared programs. Lyndonville hosts the boys volleyball, girls varsity soccer and the musical program. Medina hosts a merged boys varsity soccer, varsity football, cross country, the marching band and swimming. Both school districts in February approved new four-year agreements for the shared programs. District leaders met last week to discuss an increased outreach for the shared programs. They decided to have an open house on June 17. Besides coaches and athletic directors, the open house will include the district superintendents, leaders of the Board of Education, and the Sports Boosters from both districts, said Jason Smith, Lyndonville district superintendent. He would like there to be an annual open house, with the districts rotating as the host site. Smith discussed the shared sports open house during Monday’s Board of Education meeting in Lyndonville. He also said Jim Steele, leader of the Medina marching band, would be meeting with Lyndonville students this week to welcome them to be part of the band this fall. Lyndonville usually has had two to five students in the Medina band. Steele would be happy to welcome more Lyndonville students in the program, Smith said. 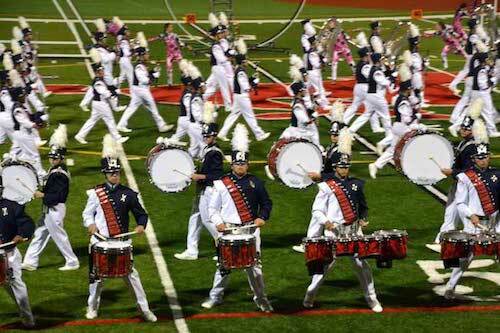 Medina band leaders also will have a parent meeting in May in Lyndonville. Lyndonville has a marching band that performs in the Memorial Day and Fourth of July parades. Medina’s band performs in many competitions during the fall and spring. MEDINA – Takeform, the national experiential graphics and way-finding firm, has acquired PrintLeader, a Buffalo-based, full-service, large-format digital printing and installation company. Following a year of successful collaboration on national accounts, this transaction enhances Takeform’s custom commercial wallcovering and window film line. Additionally, the two organizations share an attitude of innovation. Like Takeform, PrintLeader continuously focuses on the growing needs of its clients to differentiate and enhance customer relationships through graphic-rich environments. PrintLeader will become part of the Takeform organization, and its capabilities will supplement the company’s extensive services and products for the built environment, which include way-finding, graphic design, project management, installation, recognition systems, plus a wide range of industry-leading products. Takeform is a nationally-recognized, award-winning experiential graphics and way-finding firm. The company focuses on building long-term relationships by providing its clients with a full service, end-to-end solution that simplifies processes and maximizes value. Clients include many of the leading architecture firms, Fortune 500 companies, healthcare systems, and higher education organizations in North America. 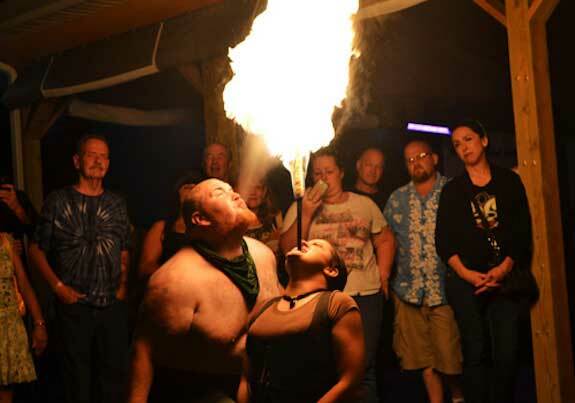 Photos by Tom Rivers: Arlowe Price, a self-described fourth-generation “circus freak performer” from Buffalo, blows fire from a flame held by Riley Schilacci. Price also chewed broken glass, set a mouse trap on his ear and tongue, and performed other outrageous stunts during the Steampunk Festival on Aug. 31, 2013 at Leonard Oakes Estate Winery. MEDINA – Some big news in the Orleans County cultural life calendar: the Steampunk Festival at Leonard Oakes Estate Winery is moving the Orleans County 4-H Fairgrounds. And the PLAY/GROUND art show that debuted at the former Medina High School last year will be back. Leonard Oakes started hosting Steampunk in 2011. The winery bills the event “as a festival of bizarre proportions.” It draws more than 1,000 people to the winery on Ridge Road. 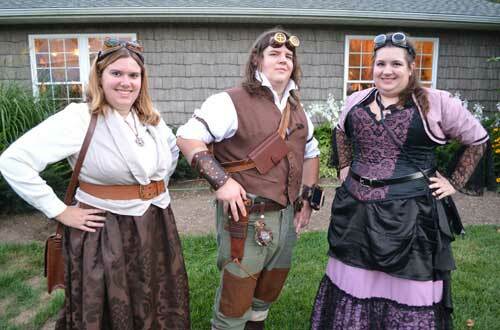 Most of the attendees at Steampunk wear futuristic costumes with a Victorian theme. The Steampunk Festival draws people in outlandish costumes, with top hats, goggles and robotic arms as accessories. These attendees at a recent Steampunk Festival in Medina include, from left: Angela Loveland of Niagara Falls, and siblings Adam Cordell and Katie Cordell of Mercersburg, Pa. The festival features fire artists, belly dancers, bands, hoop dancers, crooners and food trucks. The event also celebrates the winery’s steampunk hard cider. Moving it to the fairgrounds on Aug. 31 this year will allow the winery to better accommodate the large crowds. 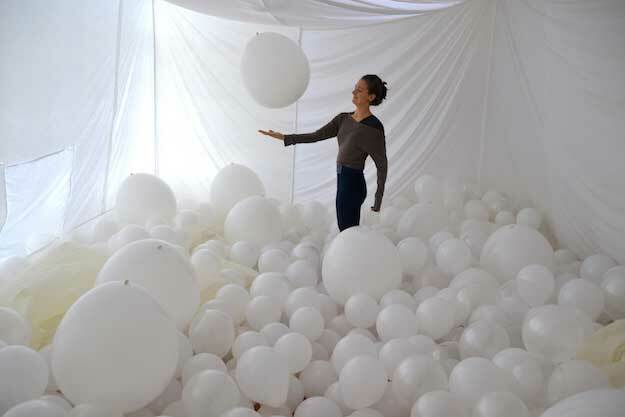 Kyla Kegler of Buffalo created “Thin Space” during the PLAY/GROUND art show last October. She welcomed people to get in the space with the balloons. 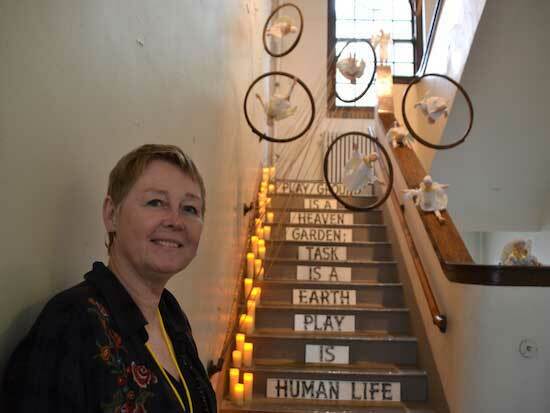 Last October also was the debut of a big art show at the old Medina High School. About 1,000 people were in the school over three days to see 29 different art exhibits that were part of PLAY/GROUND. Organizers announced PLAY/GROUND will be back this fall with the school hosting artists again from Sept. 27-29. Artists can display their work in classrooms, two bathrooms, stairwells and an auditorium at the school building, 324 Catherine St. Applications from artists will be accepted from April 12 through May 19, with late applications taken until May 26. Artists will be notified in mid-June if their proposal is selected. Michael Hungerford, regional director for Takeform in Medina, helped spearhead the project last year. Hungerford read about a similar project as PLAY/GROUND in a vacant warehouse in New York City. Hungerford knew the old Medina school would be vacant. His uncle Roger Hungerford acquired it from Calvary Tabernacle Assembly of God Church and has plans to create apartments out of the school. First, Hungerford is working to renovate the former Bent’s Opera House on Main Street. Michael pitched the idea of the art installations in the school and the Roger backed the project. The school remains available this year while crews work on the Bent’s building. For more on PLAY/GROUND, including an artist application, click here. 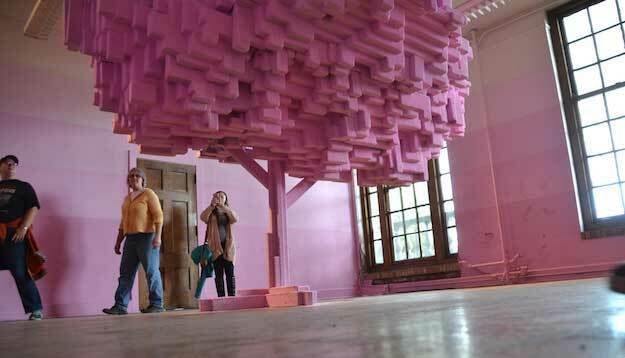 Colleen Toledano made this piece with pink foam, which proved popular for photos.